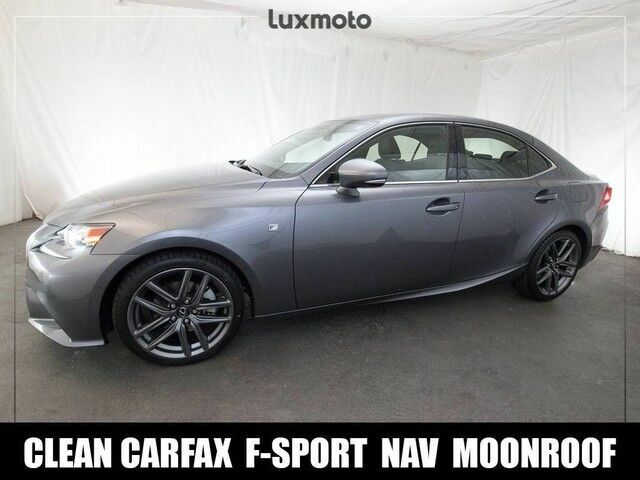 **Carfax Certified 1-OWNER**, **FACTORY WARRANTY REMAINING**, Lexus IS 250 F-Sport, **MUSIC STREAMING**, **NAVIGATION**, **BACK UP CAMERA**, **BLIND SPOT MONITOR**, **SMARTPHONE INTEGRATION**, **HEATED/COOLED SEATS**, **ENHANCED BLUETOOTH**, **MUSIC STREAMING**, **SATELLITE RADIO**, **USB & AUX PORTS**, Navigation Package (HDD Navigation System w/Advanced Voice Command, Bluetooth Hands-Free Phone, HD Radio w/iTunes Tagging, DVD Player, Lexus Enform Safety Connect 2.0, Rear Back-Up Camera w/Dynamic Gridlines, Telematics, and XM NavTraffic/XM NavWeather/XM Sports), Proximity Key For Doors And Push Button Start, Power Sport Bucket Front Seats with Drivers Memory, LED Automatic Headlights, Tilt/Telescopic Steering Wheel with Paddle Shift, LED Daytime Running Lights, Auto-Dimming Rear View Mirrors, Dual-Zone Climate Control and much more. Come see this Exhilarating IS in our Indoor Showroom by Appointment. The mid-size performance sedan segment is a popular place, but the Lexus IS sedan more than holds its own among the offerings from INFINITI, BMW and Cadillac. While powertrains remain the same for 2015, top-to-bottom refinement everywhere else -- along with Lexus' unbeatable build quality -- has made the IS a bigger and yet more dynamic driver's car. Strengths of this model include technology options, all-wheel drive availability, Attractive styling, and build quality and refinement.